On ship-tracking Web sites, the waters are black with dots. Each dot is a ship; each ship is laden with boxes; each box is laden with goods. In postindustrial economies, we no longer produce but buy, and so we must ship. Without shipping there would be no clothes, food, paper, or fuel. Without all those dots, the world would not work. Yet freight shipping is all but invisible. Away from public scrutiny, it revels in suspect practices, dubious operators, and a shady system of "flags of convenience." And then there are the pirates. Rose George, acclaimed chronicler of what we would rather ignore, sails from Rotterdam to Suez to Singapore on ships the length of football fields and the height of Niagara Falls; she patrols the Indian Ocean with an anti-piracy task force; she joins seafaring chaplains, and investigates the harm that ships inflict on endangered whales. Sharply informative and entertaining, Ninety Percent of Everything reveals the workings and perils of an unseen world that holds the key to our economy, our environment, and our very civilization. 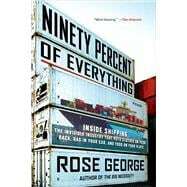 Rose George is the author of Ninety Percent of Everything: Inside Shipping, the Invisible Industry That Puts Clothes on Your Back, Gas in Your Car, and Food on Your Plate, The Big Necessity: The Unmentionable World of Human Waste and Why It Matters and A Life Removed: Hunting for Refuge in the Modern World. A freelance journalist, she has written for The New York Times, Slate, Harpers, and the Financial Times. She lives in London.